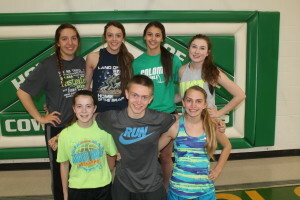 Colome High School track team has 14 athletes on the team. The returning letterwinners for the Colome girls team are Haley Krumpus, Jaclyn Laprath, Callie Heath, Taylor Hrabanek, Morgan Hofeldt and Kaydee Heath. Krumpus will run the 100, 4×200 relay, triple jump and long jump. Laprath, who ran at the state meet last year will run the 800, mile, 2 mile and 4×800 relay. Callie Heath will be in the 200, 400, 4×200 and 4×800. Hrabanek will run the 200, 4×400 and 4×800. Hofeldt will be in the 4×400 and 4×800 relays and for field events will be in the long jump. Other girls on the team are Grace Campbell, a freshman, who will throw the shot put and discus; Hanna Rowe, shot put and discus; Matrix Noteboom 4×200, 4×400 and 100 and 200; Destannie Noteboom, 100, 200 and 400. The returning letterman for the boys is Andrew Laprath. Laprath will run the 400, 800, mile plus will do the triple jump and high jump. Other boys on the team are Wyatt Cahoy, shot and discus; Zane Rohde, shot put and discus; Matt Campbell, shot put and discus; Ethan Gehlsen, 100, 200, long jump and high jump.